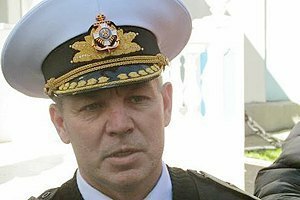 Vice-Admiral Serhiy Haiduk remains the commander of the Naval Forces of Ukraine, the press center of the Naval Forces of Ukraine said. In particular, in the first half of the day he as the Navy top commander held a courtesy meeting with the visiting Turkish seamen at the frigate Hetman Sahaidachny, the press release reads. On April 1, Odessa publication Dumskaya alleged with a reference to a source in Ukraine’s General Staff that President Petro Poroshenko replaced the commander of the Naval Forces of Ukraine Serhiy Haiduk with Ihor Voronchenko. The scandal around Haiduk sparked in February, when members of volunteer organizations that help the Navy accused Haiduk of sabotaging reforms in the Navy according to NATO standards.